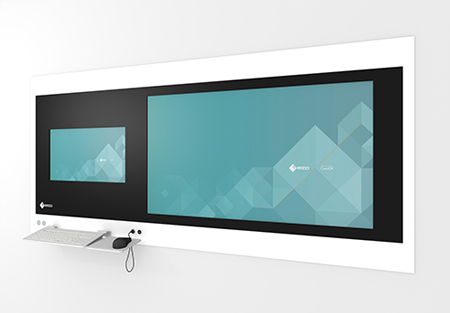 Karlsruhe, Germany, October 13, 2015 – EIZO GmbH is expanding its portfolio with the addition of its CuratOR Surgical Panels – individually configurable wall consoles for the operating room. These digital viewing systems consist of one or more integrated monitors – as well as IT and video management components – that function as the central console in the operating room. EIZO entered the market for customized OR solutions with its CuratOR brand in October 2014. These Surgical Panels are the newest addition to the EIZO product family for this segment. What makes these Surgical Panels unique is the high level of flexibility in the material, configuration and accessories, which are all individually customized to meet customer needs for the respective operating room. Customers have much freedom when selecting the number and size of the monitors to install as well as the configuration of the integrated PC that can also be set up as an IT module for easier servicing. The panel housing is made of powder-coated steel, and its front comes either as a steel-glass combination or entirely of glass or steel. Customers can choose the housing and front color from the RAL color spectrum. Screw-free locking systems additionally lend an overall uniform look. A silicon keypad and mouse that can be completely disinfected are provided for data entry. Also, the built-in monitors can be configured as touchscreens, thus offering additional data entry and user options. Accessories, such as barcode readers, speakers, watches, temperature displays and other interfaces can also be integrated and are included in the configuration scope of the Surgical Panels. This allows for a tailor-made product designed to meet the customer's needs and requirements. The Surgical Panels can be installed flush-mounted or surface-mounted to the wall to save floor space. The device's revolutionary opening concept additionally facilitates installation as well as easy and problem-free service without the need for time-consuming removal. Combined with additional EIZO products for the operating room, such as the Large Monitor Manager LMM0804 and the Surgical Monitor EX270W, the Surgical Panels can be used to create the most effective solutions for the most diverse customer requirements. Visitors to the Medica 2015 trade show (November 16-19, 2015) in Düsseldorf, Germany, can see the new products for the first time at the EIZO booth, Hall 10, #H41.